"It is appalling that the governments gathered here were unable to finally put the brakes on this slow-moving crash of an environmental disaster. Instead, the European Union used its political muscle to ensure the continuation of the tuna farming business responsible for the current situation." For more details watch Greenpeace's "Time and Tuna Are Running Out". Even WWF, who have cravenly kowtowed and pandered to the salmon farming industry, are deeply critical of the tuna farming industry which it considers "is having a devastating affect on wild populations." Feed companies such as Skretting (which also feeds the salmon farming industry) are now attempting to brand tuna farming as "sustainable" and develop tuna feeds rather than wild fish which has a feed conversion ratio of 20 to 1. "There is a hitch: salmon and many other farmed fish are carnivorous, and farming them involves feeding them with animal flesh, just as farming mountain lions would. In this case, the animal flesh, supplied in the form of pellets, consists of ground up sardines, anchovies, mackerels and other edible fish caught mainly - you guessed it - in developing countries. About 3-4 pounds of ground up small fishes are required to produce one pound of farmed salmon. Thus, the more farmed fish we produce, the less fish there is. This is akin to robbing Pedro to pay Paul. And mind you, this doesn't even begin to address the issue that the small fish we remove from the sea to feed farmed salmon, pigs and chickens (fish-eating chicken! ), would have been the prey of beloved animals, like majestic seabirds and frolicking dolphins. Indeed, in the Mediterranean, where tuna 'farming' is now widely practiced, the removal of small fish for tuna fattening has been so extensive that the 'common dolphin' is becoming rare, with individual dolphins showing protruding ribcages like the mangy dogs one would see at the edge of Sahelian towns." 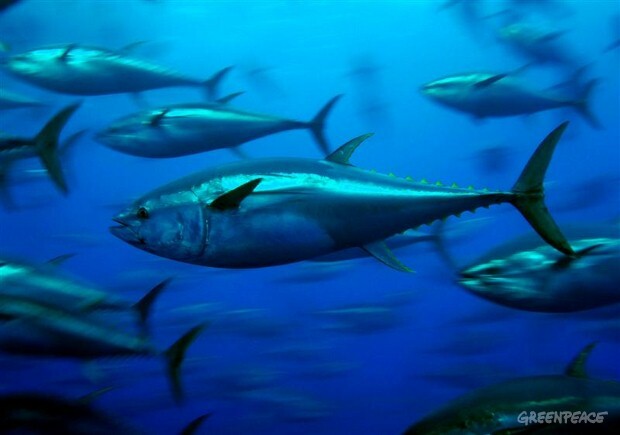 Read the WWF report "Tuna Farming in the Mediterranean". Watch the 'tuna cowboys' in National Geographic's video: "Tuna Corralled in Floating Farms". Watch "SHOCKING: The Story of the Bluefin".